It's autumn in Santa Fe, and Ellen Rosings is planning her Aunt Nat’s wedding at the Wisteria Tearoom. Her progress is derailed by a dead body—yes, another one—that she finds in her aunt’s driveway. Soon the dead artist starts appearing in Ellen's dreams, holding the knife that was found beside him. He wasn’t stabbed. What does it mean? 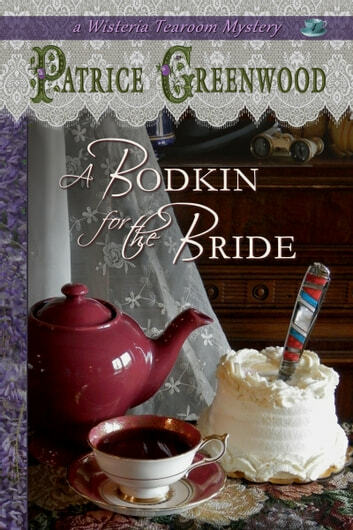 This cozy mystery is the fourth in the Wisteria Tearoom Mysteries series. I absolutely love this series - can't get enough of them! I love the way Patrice Greenwood writes; the attention to detail, the correct grammar and punctuation. I especially love the main characters - by book 4, I feel as if they are old friends and I have seen them bloom. Gorgeous! Can't wait to get my hands on book 5. I loved this book and the series. It is well written, descriptive and the people are believable. I'm looking forward to the next one to see if some of the ongoing mysteries will be solved. Have just finished Bodkin for the bride. And enjoyed it enough to go for the first in the series... Being English it seems very homily to me and I look forward to enjoying another great read. Thank you for sharing ethereal stories with you readers... GR..